Scott Steinhardt, President of HYDRO SYSTEMS, meticulously expands his father’s vision with a product line that is consistently revolutionizing the industry. Devoted to the highest standard of excellence, HYDRO SYSTEMS also takes pride in being a GREEN company. The 100,000 square foot environmental facility in Valencia, CA features solar roof panels that collect enough energy to offset all the power used during manufacturing while also boasting a climate-controlled room that filters 100% of all hazardous gasses. 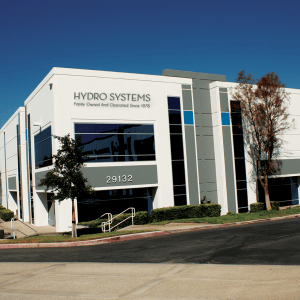 The Hydrosystems factory is based in California, all of our products are proudly made in the U.S.
We can customize any product to fit your needs.